We are Jerman Samuels & Pearson LLP, a firm of solicitors specialising in crime, regulatory and road traffic law work, with offices located in the Essex area. We represent individuals facing prosecution by a wide range of agencies, including the Crown Prosecution Service. You have instructed us to act for you, or we have taken steps at your request with a view to instruction and we have received personal data about you as a result. There are two types of personal data. Firstly, there is the general data that everyone has, like name, postal address, telephone number, and email account. Secondly, there is more sensitive data, such as health records, race, religious affiliation, sexual orientation, criminal conviction records, and details relating to children. We hold personal data because we have a contract with you, or we have taken steps at your request prior to entering a contract with you. Even though you may not pay anything or much towards our fees because you are in receipt of legal aid or have an insurance policy, any contract or pre-contract arrangement is between you and this firm. We hold sensitive personal data only because it is necessary for the purposes of acting for you in legal proceedings or in anticipation of legal proceedings. It is our responsibility to use the data you provide only for the purposes arising from our contract with you or in preparation for a contract. In order to fulfil our obligations to you it may be necessary to share your data with others such as agents, barristers, experts (for example a forensic scientist) and interpreters. Because you benefit from legal aid or from insurance cover, it will also be necessary to share data with the Legal Aid Agency or with the insurance organisation that agrees to meet your fees. We are proud to hold Lexcel accreditation. 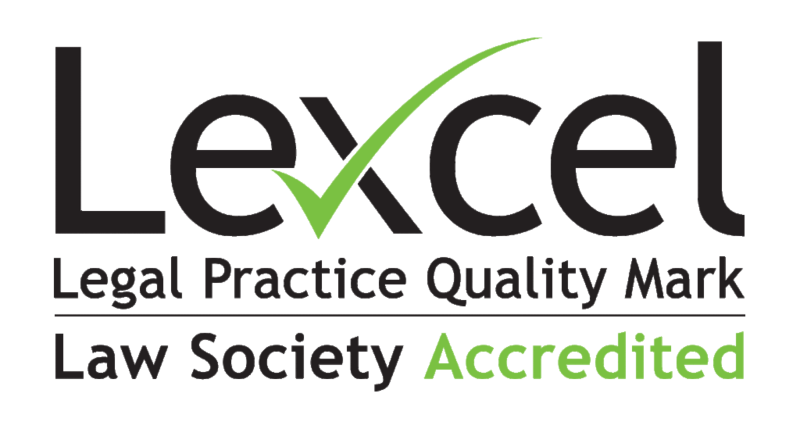 Lexcel is a legal practice quality standard administered by the Law Society of England and Wales. It is designed to assist in ensuring high standards of client care. We undergo yearly Lexcel audits and are always complimented on the standards we achieve. It may be necessary to share data with Lexcel auditors. We have a practical and legal duty to store data both during a case and after it concludes. To do so, we have to use IT providers, cloud server hosts, file storage companies, web service designers, case management systems, copying specialists, secretarial services and others. It will be necessary to share data with them. Please rest assured that we have entered into written agreements with all and any external parties we may instruct or otherwise use for the purposes in furtherance of your instructions, in which we make very clear the data protection care and confidentiality owed to you. Communications between solicitors and their clients are generally covered by what is known as legal professional privilege. This prevents those communications being disclosed without your permission. Privilege is a protection you enjoy on top of your rights under the Data Protection laws. However, where we come to know about or suspect money laundering or terrorist financing we are under a legal duty to make report to the National Crime Agency. This means that we will have to pass on your data to the relevant authorities if we observe suspicious financing activity, irrespective of privilege or data protection rights. We have the responsibility to keep your data safe. To that end, we ensure that all information we store is protected by security measures. All portable devices are password protected. All our staff receive data protection training. In the event that there is a data breach that affects you, we are under a duty to tell you of it within 72 hours and to make a report to the regulator. Please note that others, such as prosecution agencies, will also have acquired your personal data. We cannot control what they do with that data. If you have concerns about the way they use it, you must address those concerns to them. You have a number of rights in addition to the right to be informed (as we have done above), the right to a guarantee that we will use your data only in furtherance of your instructions (as we have explained), and the right to data security. You have the right to be provided with access to the data about you that we hold, as long as the request is a reasonable one. If the information we hold about you is inaccurate, you have the right to ask that we make corrections. The data protection laws provide partial rights to be forgotten and to limit use of data. We do not think that we could comply as we have legal obligations that are not compatible with any such request. If you transfer your instructions, we will of course, also transfer your data to your new solicitors (as long as our fees are paid). We will retain your data for a period of 6 years after your matter has concluded. Thereafter, we will cause all physical files to be destroyed and we will ensure that all data held electronically is deleted. Our Data Protection Officer is Matthew Bone. Jerman Samuels & Pearson LLP is committed to ensuring that your privacy is protected. Should we ask you to provide certain information by which you can be identified when using this website, then you can be assured that it will only be used in accordance with this statement. Jerman Samuels & Pearson LLP may change this policy from time to time by updating this page. You should check this page from time to time to ensure that you are happy with any changes. We hold personal data because you have visited our website. We are entitled to hold personal data (such as your internet protocol addresses, cookie identifiers or other identifiers) because we have your consent to do so. We do not collect any sensitive personal data (such as your ethnicity, health, political views, etc). We will not pass on personal data obtained through our website to any third parties except those we may instruct directly to measure the success of our website as a marketing tool or for the purposes of security. We use any information you supply us through our website strictly for limited marketing analysis purposes. A cookie is a small file which asks permission to be placed on your computer’s hard drive. Once you consent, the file is added and the cookie helps analyse web traffic or lets you know when you visit a particular site. Cookies allow web applications to respond to you as an individual. The web application can tailor its operations to your needs, likes and dislikes by gathering and remembering information about your preferences. The site then ’knows’ that you have been there before, and in some cases, tailors what pops up on screen to take account of that fact. If this is your first visit to our website, you will be asked for your consent to send you a cookie. You can choose to accept or decline cookies. If you decline no personal information will be retained.